Union Minister of State for Power, R.K. Singh and Chief Minister of Uttrakhand, Trivender Singh Rawat today laid foundation stone of SJVN’s 60 MW Naitwar Mori Hydro Electric Project at Mori. The project is located on River Tons, a major tributary of Yamuna on the Ganga basin, in Uttarkashi district of Uttarakhand. Smt. Mala Rajya Lakshmi Saha, MP of Tehri Garhwal, Raj Kumar, MLA Purola, Gopal Singh Rawat, MLA Gangotri, Kedar Singh Rawat MLA Yamunotri, besides Ajay Kumar Bhalla, Secretary (Power), Nand Lal Sharma, Chairman and Managing Director SJVN, and other Directors were also present on the occasion. Talking to the dignitaries, Nand Lal Sharma, CMD briefed that the project on completion will have a 30.5 meters high Dam, 4.3 kilometres long Head Race Tunnel of 5.6 meters dia, and a 51.65 m deep Surge Shaft. The Underground Power House of the project, he told will have two Vertical Francis type Turbines of 30 MW each. Nand Lal Sharma further explained that SJVN had to its credit the experience of constructing and commissioning the 1500 MW Nathpa Jhakri Hydro Power Station and 412 MW Rampur Hydro Power Station on Satluj basin in Himachal Pradesh. He assured that the project would be commissioned in record period of 48 months. Nand Lal Sharma, CMD also informed that the Naitwar Mori Hydro Electric Project had been designed as a standalone run of the river project. One of the major features of the project was that there is no displacement of population from the project site. CAT plan of the project, he added, had already been approved by the Govt. of Uttrakhand. Ministry of Environment and Forest has also accorded the clearances. The R&R Plan for the project with budget outlay of Rs. 14.45 Crores, he told, had also been approved by Govt. of Uttarakhand. After commissioning, 12% free electricity will be supplied to the State of Uttarakhand as royalty while the Project Affected Families will be provided an amount equivalent to cost of 100 Units of electricity per month for ten years. Chief Minister of Uttrakhand, Trivender Singh Rawat, while welcoming the Hon’ble Union Minister of State for Power, appreciated the role of SJVN in developing this project in Uttrakhand. He promised all assistance and help from the state Government and administration of Uttrakhand in expeditious completion of the Project. Inaugurating, the Union Minister of State for Power, commended the efforts of SJVN and government of Uttrakhand for developing this project. 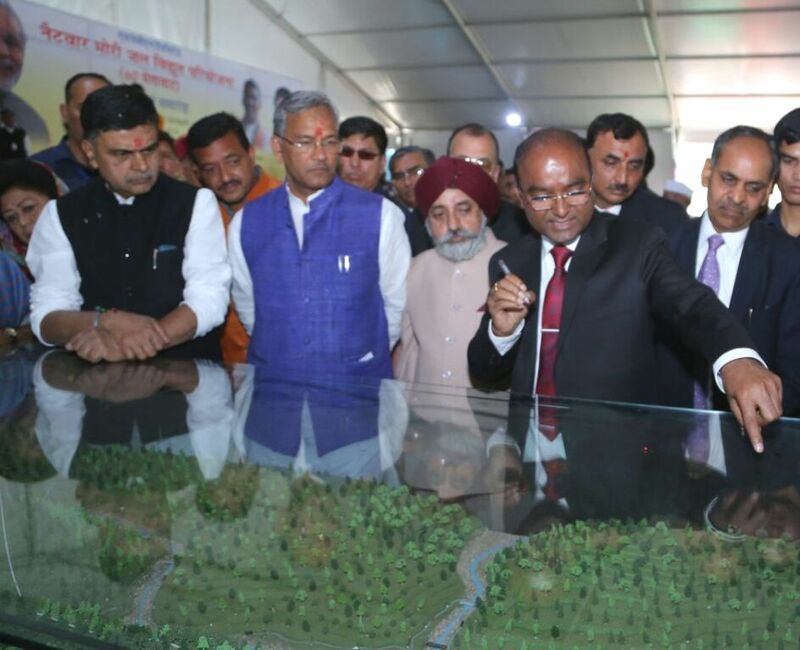 He hoped that the project would go a long way in meeting the energy demands of Uttrakhand. The Hon’ble Minister gave his assurance of all necessary co-operation of Ministry of Power in fully electrifying the State under the Saubhagya Scheme launched under the dynamic leadership of hon’ble Prime Minister Sh Narendra Modi. The project has the potential to generate 265.5 Million Units of electricity every year. The estimated cost of the project at October, 2016 Price Level is Rs. 648.33 Crores. Construction period of Naitwar Mori project is 48 months. The Main Civil Works as well as three packages for project roads have already been awarded by SJVN Limited, a Mini Ratna & Schedule ‘A’ CPSU under the Ministry of Power, Govt. of India. Incorporated in the year 1988, the Company has fast emerged as a major power player nationally as well as globally.